The Puerto Rican effort to advance from response to recovery after Hurricane Maria continues. For some, water and electricity are still elusive. And that makes it hard to get back to normal — especially for children. An after-school program is designed to pick up when school lets out. The program – which has no formal name – is organized by volunteers and the nonprofit Save the Children. In a territory still lacking basic utilities in some places, Facebook access and YouTube videos are a lower priority. But kids need something to do. 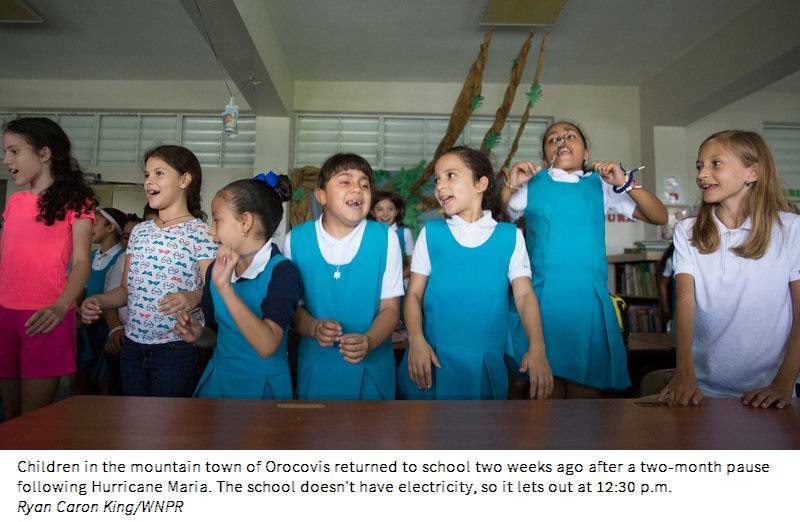 School started again in mid-November in the mountain town of Orocovis – two months after Maria passed. Even now the school building doesn't have electricity, so the day ends at 12:30 p.m. But one day last week, 51 children stayed behind for more. Before splitting up for activities, they began with songs that got them moving — practicing their lefts and rights, and smiling. Parents say the after-school opportunity is a safe place for them to send their children. It gives adults time to work and to try and deal with the daily stress of living without basic services. That stress affects the kids, too. 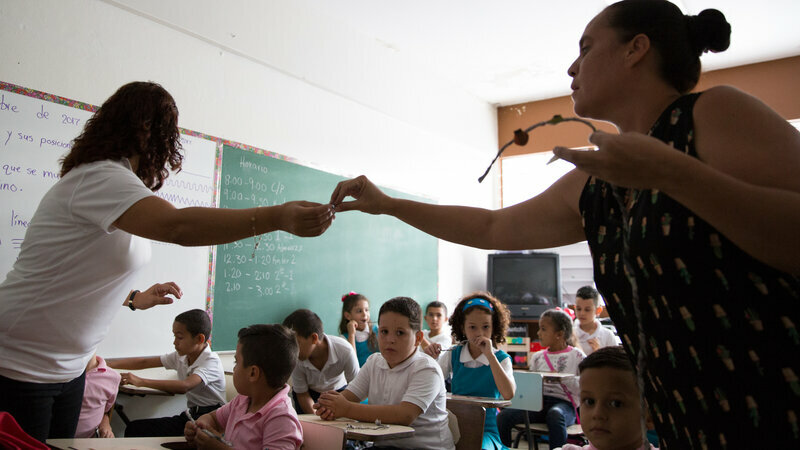 Wanda Medina, a science teacher in Orocovis, said she decided to use the situation as a teachable moment in her classroom. She posed a question to her students: "Nature has been affected, and human beings have been affected. Which [will] replenish more quickly?" All of them said nature. The children spoke from their own observations. They told her that trees have already grown new leaves. Their families and friends, however, lost things they can't get back, like valuables their parents gave them. Three of Medina's students lost their entire home. Parent and volunteer Giovanni Caballero Fuentes was luckier. His family didn't lose their house, but his kids watched the storm rip off their neighbor's roof. He said he's hoping they soon forget the sound of the wind and rain, and learn to deal with life without electricity, without water, and without technology. "Back to basic," Caballero Fuentes said. He and his kids play board games at home, and they look for other ways to distract themselves. Still, his 10-year-old daughter Nadjah said she is happy to be in the after-school program. "Because it is very fun," she said. Luis Santiago's grandson, Janiel, participates in the program. Santiago said his grandson often stays with him because his daughter works two jobs. He's a retired elementary school teacher, and he knows how important routine is for kids. "It's a little bit difficult, you know, [to] have normality," Santiago said. "We don't go to the movies, we don't go to the places where before we can go. But before was great. But now it's very difficult." Eugenio Soto Santiago teaches during the day and leads some of the after-school activities. He said many of his students thought that their island would never be the same after Hurricane Maria. However, small bits of regular life are coming back into view. "Even though we don't have electricity, and sometimes we don't have water, they're turning back to that ... this is our new normal," Soto Santiago said. "And they're able to handle it.